Remembering memories with mum and looking back at the three main stages of Alzheimer’s she went through. Some of the best child-hood memories I have with my mom are of the road-trips our family took out west during summer vacations. My dad was the designated driver and my mom the fearless camp leader. We had a Buick station wagon with three seats. The third seat became the treasured “kids-only” escape hatch when one of us needed a quiet place to sleep. The middle seat was the “kids’ hang-out” where me and my sisters passed the travel time weaving macrame belts, crocheting scarves and needlepointing pillow covers (it was the 1970’s), while my brothers teased and annoyed us. In the front seat my mom sat beside my dad and wrote in her journal. She jotted down special family moments as we explored the day’s mapped out landmarks. My mom found beautiful campsites and within them chose the perfect area for my dad and brothers to set up our sleeping quarters — a borrowed Boy Scout tent. In the chill of the early mornings my dad made breakfast for us on the Coleman stove. To this day I love waking up to the sizzling sound and warm smell of bacon and eggs cooking. In the afternoons my mom would take us on hikes in the mountains. During our treks we passed by many wildflowers and she knew the names of all of them. Trillium was her favorite flower. And at night, when the air got colder we made campfires, ate s’mores and sang songs to my dad’s accordion music. At gas station stops we would all jump out of the car to stretch, use the bathroom and stock up on treats for the road. 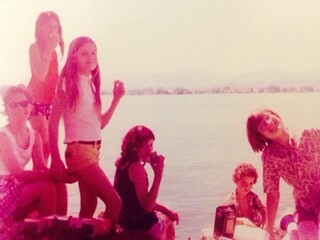 With five kids it was often difficult for my parents to keep track of us. I remember one time, when we had all piled back in the car after a “fill-up”, we drove away and soon realized that my sister was missing. My dad turned the car around just in time to see her running towards us looking traumatized and screaming, “You forgot me! You forgot me!” Oops. Eventually my parents upgraded from the tent to a pop-up camper. One summer my dad drove us to the desert trailing our new camper on a hitch behind our station wagon’s back bumper. During the sunny days we would climb the sand dunes. Me and my sisters would do gymnastics on the way down and my mom captured the moments with her camera. In the hot evenings my mom turned cold, wet beach towels ingeniously into sheets, placed them on top of our camper cushions and made outdoor beds in the sand. Our make-shift mattresses kept us cool as we slept underneath the brilliant star-filled sky. Our summer vacations ended when me and my brothers and sisters left for college. But my mom never stopped traveling. She got a new airline job, which allowed her and my dad to fly for free. Soon my parents were like newlyweds flying to romantic destinations like Italy and Thailand. Over the next fifteen years they flew around the world together. My mom loved to fly and encouraged me and my brothers and sisters to travel, too. I remember her often telling us that when she died she wanted to be reincarnated as a bird so she could use her own wings to fly. One year, my mom and I took a special Mother’s Day trip to Paris, France. Her airline seniority got us upgraded to first-class. 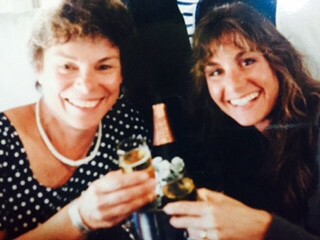 As we flew over the ocean, we drank free champagne and giggled like silly girls. When the stewardess brought us our four-course French inspired meals, we savored every flavorful bite. Once in Paris, my mom and I joined other visiting tourists to view Paris’s treasured art collections magnificently displayed within the city’s historic museums. We took pictures of each other mirroring the stoic expression of Leonardo Da Vinci’s Mona Lisa and the statuesque pose of Rodin’s The Thinker. After long city walks we would rest on garden benches and admire the children of stylish French families race tiny sailboats across the water in the ancient fountains. In one of these gardens I have a special memory of my mom riding an old-fashioned merry-go-round. She smiled and waved at me when she twirled by looking like a child riding her favorite rocking horse as it moved up and down to the carnival music. We ended our daily Parisian adventures back at our art deco style bed and breakfast where we would rest up for a late dinner. At night we explored the cobblestone side streets until we had discovered a tiny crowded restaurant that we both liked. I remember sharing stories together and laughing as we drank french red wine and ate fresh mussels. Traveling home we exchanged a champagne filled toast and acknowledged how grateful we both were to have shared such a special adventure together. At sixty-two my mom retired from the airlines. 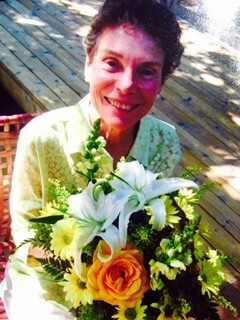 She enjoyed her grandchildren and did volunteer work at The Botanic Gardens. During this short time my mom also dealt with the deaths of her elderly father and her first born daughter — my oldest sister. Soon after these two life altering events happened, my mom began showing mild signs of memory loss. She began to repeat the same stories during our conversations. Her progression happened slowly so it was hard for our family to determine if she really had Alzheimer’s or if some of her forgetfulness was due to aging. When she called me by a different name I realized that something wasn’t right with her. Overtime when our family mentioned the word “doctor” my mom would get nervous and I wondered if she knew what was happening to her. Eventually, we convinced her to see a neurologist who did some standard memory tests to determine if she had the symptoms attributed to Alzheimer’s Disease. The doctor confirmed that my mom was showing the mild signs of stage one Alzheimer’s and prescribed medication to slow its progression. Now that we had an official diagnosis it was difficult for our family to accept that our vivacious mother would slowly fade away from us. Each family member dealt with my mom’s illness differently. I went into denial and tried to ignore my mother’s changing personality. But over the next five years my mom’s symptoms moderately progressed to the second stage of her disease and it was no longer easy for our family to ignore the fact that Alzheimer’s was slowly killing her. She began to pay less attention to her hygiene, dressed differently and became angry when she misplaced something. My dad was doing his best to care for my mom, but the mental stress of watching a vicious disease like Alzheimer’s rob his wife of her memory, became more difficult for him. 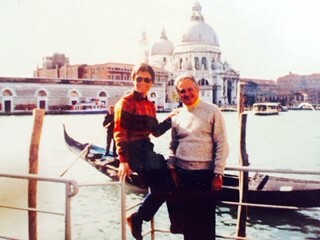 Acknowledging that my dad needed a break from caring for my mom, I took her away on a trip. Together we flew to visit my brother in San Francisco. Needless to say it was difficult for me to help her through security at the airport. If I wasn’t watching her closely she tended to wander off. Any stress I felt disappeared when I saw how happy she was to be on an airplane again. She walked up and down the aisles singing to the other passengers. They were compassionate towards her and enjoyed my mom’s lively spirit. My mom couldn’t be left alone at my brother’s house. At night my mom and I slept in my nephew’s room on bunk-beds. She slept on the bottom bed and I slept on the top bed. One night she woke up disoriented and couldn’t make it to the bathroom. When she realized what had happened she started to cry. That’s when my brother and I realized how difficult it must have been for my dad to care for my mom twenty-four hours a day, seven days a week. We knew we needed to make a family decision to move my mom out of the house so she could get proper care. On the trip home my mom turned to me and said, “Thank you”. I think she knew that this would be the last time she would ever fly in an airplane. After San Francisco our family found an assisted living facility to move my mom into. It was emotionally hard for us to move her out of the home my dad and her had built and raised their family in for over fifty years. We all felt guilty and unsure about our decision. We didn’t want my mom to feel anxious during the move, so we devised a plan to make her transition easier. We would spread out our visits over the next sixty hours so she wouldn’t feel alone and get scared. My dad and younger brother made my mom’s new room feel familiar with some of her favorite furniture and personal items. The next morning I drove my mom to her new home. As I opened the door to her room my mom gasped, got anxious and asked me when we were going home. I calmed her nerves when I told her she was only going to be visiting for the day. In the afternoon, when my sister and her family arrived, I left and they spent the afternoon doing fun activities to help entertain and comfort my mom. The next day my older brother and his family took my mom to McDonald’s for lunch and ordered her a Happy Meal. My brother told me that she loved the Fries. Our plan seemed to work because upon visiting her over the next couple of days she seemed happy in her new environment. She was staying active, had made a couple of new friends and seemed to be adjusting well in her new home. We all began to relax and feel better about our decision to move her. About one year later my mom had an incident inside the hallway at the assisted living home. She got violent and hit another patient with a hairbrush. My mom was taken in an ambulance to a nearby hospital where she was given medication to calm her down. My sister and I went to visit her the next day. When we arrived we saw her lying in a hospital bed in the middle of an open space near the nurse’s station. She was surrounded by other mentally ill patients who were making loud noises. My sister and I were shocked to see our mother strapped down in her bed looking like she was in a scene from the movie, “One Flew Over the Cuckoo’s Nest”. Her eyes looked vacant and she seemed to have lost her energetic spark. The last time we had both visited our mom at the assisted living home she was joyful. We asked one of the nurses what had happened to our mother? She told us that in the middle of the night, as our mom tried to find her way to the bathroom, she fell and fractured her hip. The doctors prescribed pain killers and also increased the dosage of her Alzheimer’s medication. We couldn’t believe how comatose our mom was and wondered if the newly prescribed drugs had killed her spirit. For the next week my mom stayed in the hospital to get hip surgery. Afterwards, we moved her into a full-time care home for stage three Alzheimer’s patients. We found a wonderful place with a compassionate staff who made my mom happy and her lively personality resurfaced for a while. But the hip surgery left her confined to a wheel chair. Being immobile eventually made my mom depressed. At this late stage in her disease visitations became mentally stressful for our family. She didn’t know who any of us were. We felt we had finally lost her. She began to rapidly decline and over the next year we had to move her to hospice care. Seeing her in the hospital was sad for me. 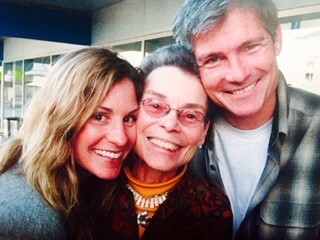 It was the same hospital that her mother had died in from her own ten year battle with Alzheimer’s. My mom had always feared she would die the same way that her mother did. I wanted to do something to try to bring joy back into her soul, so I opened up my iPad’s painting app and got my mom to paint by gently guiding her fingers across the screen. She created colorful swooshes with one hand and moved her other hand to the sound of the ambient music playing in the room. My mom could no longer talk, but from the peaceful look on her face, I sensed that she felt happy again. This was one of the last special moments I remember sharing with my mother. Pangdemonium’s The Father: Dementia & Who Will Care?